Discovery Seas Multi-Mode Gym is rated 4.7 out of 5 by 26. 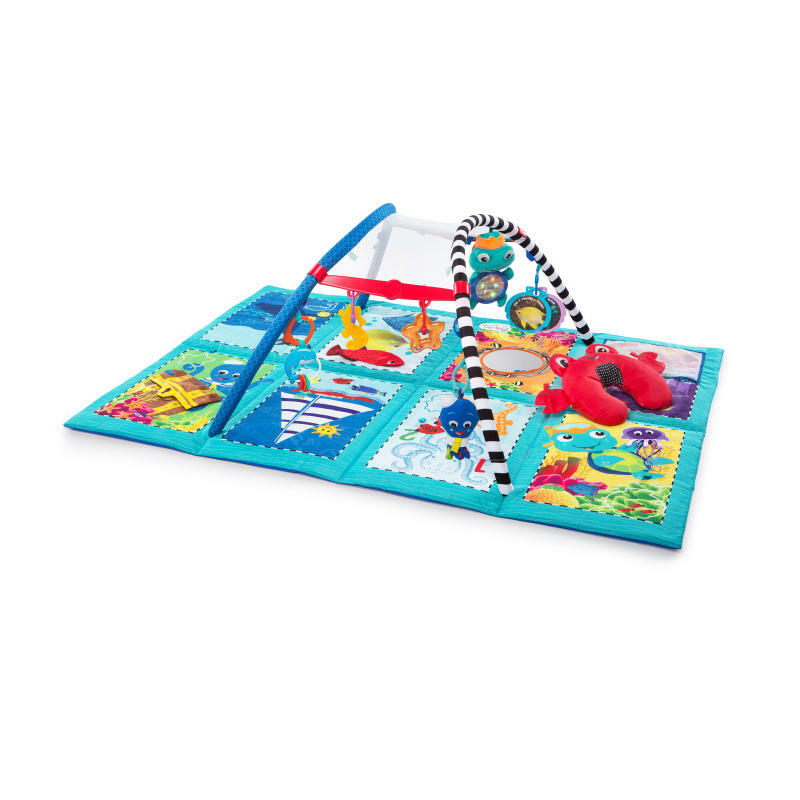 This versatile baby gym from Baby Einstein takes your little one on a voyage of adventure with lights, music and learning-inspired activities. The jumbo-sized baby mat leaves plenty of room for you and your baby to play together. Every quilted scene introduces new colors, shapes and underwater friends. Take a closer look for surprises to discover and explore, like peek-a-boo flaps, crinkle textures and hidden pockets. The crab-shaped prop pillow is perfect for tummy time, giving your baby a whole new view of the world. You can flip up the sides and attach to the play gym to keep your busy baby where they need to be. Or create a secret passageway with a crawl-through tunnel. When baby grows, fold the mat in a few simple steps to create a giant plush storybook for you and your toddler to enjoy. Dimension (in) 57" x 41" x 18"
Rated 5 out of 5 by Bmiles from Baby is having a ball My infant son had a blast with this product-- he especially liked the mirror. He kept smiling at himself! Rated 4 out of 5 by MissB from Great long lasting gym/mat Bought this from mothercare in the UK. I already had a play mat but as my 4 month old son is starting to roll, I wanted a larger mat for him to be able to move about and this mat/gym combo is perfect! Only let down is we've had it about 3 days and the mesh at the top has come away from the seem a bit, if I hadn't have thrown the box away I'd be sending it back and asking for a new one. Never mind just hope it doesn't tear even more. Despite the little tear, my son LOVES it! Rated 5 out of 5 by samora23 from Great mat! Love how large this mat is. Great for baby when rolling over. So many features to keep the baby entertained, while doing tummy time and also saying on back and looking up. Love that it can grow with baby too! Rated 5 out of 5 by Sarah23 from Love this activity gym! This activity gym has great activities to entertain my little boy, both on the mat and hanging overhead. The may is a great size too. Plus you can move the toys around to different spots. I also love that as my son gets older, it will actually grow with him by turning into a tunnel and also a book. Rated 5 out of 5 by JennaLH from Bright colors I love the bright colors of this playmat! Can't wait for my son to get here to use it! Rated 5 out of 5 by Glenn21 from Free entertainment for hours This is more than just a playmat! The versatility, bright colors, music, and overall construction make this one of the best on the market! Our baby loves the activity book! My favorite part is that it is machine washable! Rated 5 out of 5 by riwill00 from Larger than Expected This is a great product for my 10 month old baby. It's pretty big, so he has plenty of room to crawl around on it and the arches aren't so low that he can't crawl through them. The accessories are entertaining to him -- he especially likes the electronic sea turtle that makes sounds and the crab pillow. Additionally, it stores easily, so it's not hard to take it with us to the grandparents' house if we want to.